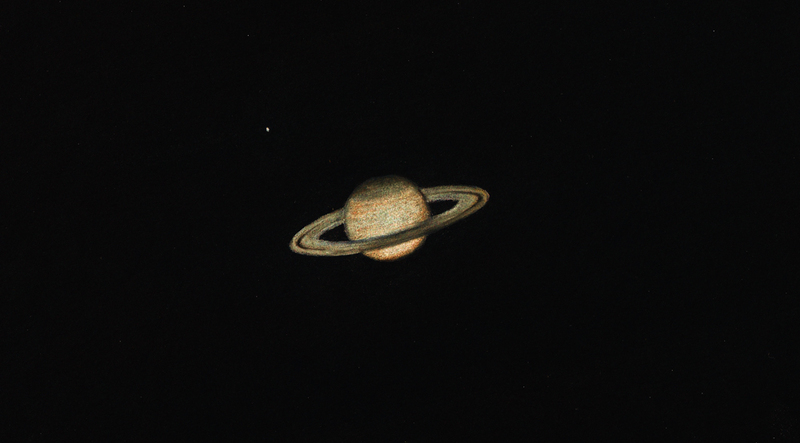 Last night I wanted to make a sketch of Saturn, mostly to capture as much moons as possible through my old 75mm f/15 Polarex/Unitron refractor. After 45 minutes of sketching at 200x with pastel pencils on black paper, Saturn was pretty much done (although I found it surprisingly difficult to draw a good ellipse for the rings), and just when I added the easily visble Titan, I heard some droplets on the trees next to me and felt something on my head: RAIN! I immediately covered the pastel sketch witch my hand and rushed inside my shed. After the sketch was save I pulled the telescope out of the rain. The most abrupt ending of a sketching session ever! I had completely missed the incoming clouds while viewing through the eyepiece. Anyway, both the sketch and the telescope survived. Sadly with only one moon observed: Titan. Hi, Roel, you made lovely sketches with nice color sensibility. I like this and your blog si famous! Certainly one of the best sketch of Saturn I have seen so far, Roel! gratts, with your “old 75mm f/15” thats a really good sketch!